When it comes to run-ins with aggressive celebrity photographers known as paparazzi, Hugh Jackman says how he reacts depends a lot on which one of his children he’s with. The actor told Jay Leno that son Oscar, 9 ½ years old, isn’t a fan of the paparazzi, but that daughter Ava, 4 ½ years old, actually hams it up for the cameras. "Oscar’s always like, ‘Oh, the paparazzi, I hate the paparazzi’. And my daughter is like, ‘Paparazzi!’ [Strikes a pose] She loves it!" he recently revealed on The Jay Leno Show. "I’m like, ‘Lets go this way.’ And she’s like, ‘But Dad, the paparazzi are this way!’"
The actor also revealed that he and son Oscar took out some aggression on the photographers during a play session in the park following a New York City snowstorm. "Oscar said, ‘Dad, I’d just give anything to throw a snowball at the paparazzi,’ and I said, ‘Well, why don’t you do it son.’ I’m a good father, lessons all the way!" 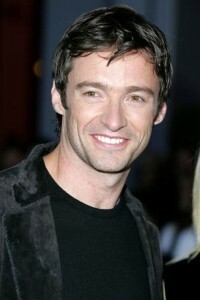 The Australian-born actor is best known for his role as Wolverine in the X-Men films. He’s been married to Deborra-Lee Furness since 1996. The family divides their time between Sydney and New York City.